Laos boasts as one of the world’s best coffee culture. The coffee in Laos is locally grown, and is quite amazing indeed. 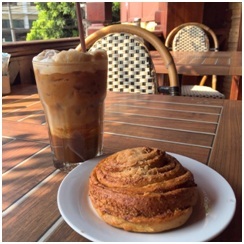 There are several cafés to choose from where you can get your daily caffeine fix, such as theScandinavian Bakery Shop, Le Trio, Naked espresso, JomaCafé. These are very close to the City Inn Vientiane and offer free Wi-Fi as well. For pastries or fresh croissants, Le Bannetonand Benoni Café are great choices.